This is another series that came to an end that I wish it hadn’t. I love Rachel Hawkins writing and I could have lived in Sophie’s world indefinitely! After the cliffhanger that ended Demonglass, with all of our mouths hanging wide open and us saying “WTH?” I couldn’t wait to get my hands on Spellbound no, I mean seriously I kinda stalked my mail box that day waiting for it to magically appear. Then when it did I sat down and started reading. I forgot about eating, I forgot about housework, I just had to read to see what happened to Sophie and Archer and all of her friends and family. Boy was it an amazing book! I love that Rachel has written a series about witches, demons, vampires, and their hunters but has done it so that there is humor involved and trust me Spellbound like its predecessors Hex Hall and Demonglass has tons of laughs. It also has tons of swoon worthy moments between Sophie and Archer and some really sweet ones between her and Cal. Basically this story has everything romance, danger, mystery, friendship, and humor. It’s the perfect kind of story. The perfect ending!!!! I don’t want to say anything that spoils it so I’m not going to go into story details I just wanted you all to know how beautiful this was and to go get it now if you don’t have it already. I did want to share a passage between Sophie and Archer. 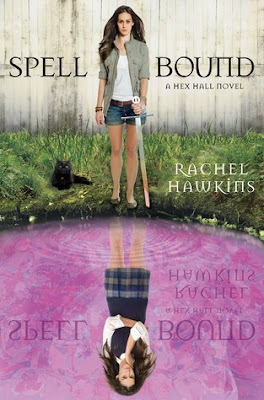 Add Spellbound to your Goodreads shelves. Great review! I've been a big fan of this series and it's sad to see it come to an end. The only disappointment with this book was the ending . . . but other than that, I loved it! I didn't realize the series was ending with this book! That seems to keep happening with books I like, the third is the last one (and I don't know it!). I think people with good series need to start taking a page (no pun intended) from Rachel Caine's and Richelle Mead's book and write at least six! I agree and I'm sure they would if they could but sometimes the publisher only contracts for three books. So honestly they could write more but that doesn't mean it'd be published.